the toes on my right foot. I'm trying to decide if I should invest in a Pilates Reformer class. Will I still be able to to use the Reformer correctly and benefit from the workout? Hello and thank you for your question. I have had to do a bit of research as I have not worked with an individual with Cerebral Palsy. Some of the symptoms and conditions are very similar though to what I see daily. Conditions such as paralysis of one side of the body, muscle weakness and lack of flexibility on one side of the body compared to another, spasticity, loss of balance and posture. 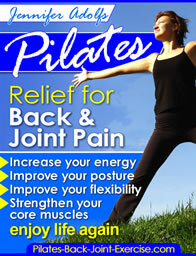 Fortunately these are all things that Pilates exercises can help to refine and realign. Flexibility is most important for you to work on and to improve the range of motion in your right foot. I believe Pilates, and the reformer can help with your feet and muscle weakness and inflexibility in general. There are some modifications you will need to take into account when getting started. In a class setting you will not get the individual attention from the instructor. If possible take a couple of individual sessions so the instructor can work directly with your physical conditions. Then look at taking a class if you feel comfortable self monitoring. I would suggest working with a light spring tension on the reformer when doing footwork until you have increased your range of motion in the right foot and without pain. Also, work each leg/foot individually. I have some reformer workouts you can view from these pages for more reference on lower and upper body work on the reformer. I also spend a lot of time with my clients working their feet to help improve their balance and confidence in walking and, just to have healthy and happy feet. I've added another link here for some helpful information on foot strengthening and stretching exercises.